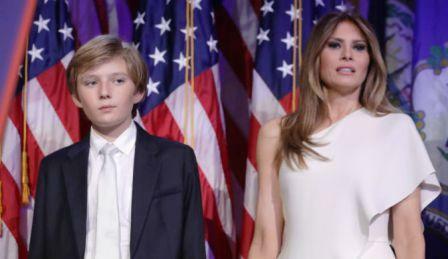 Although he reportedly takes after his father, Barron has also inherited his mother’s roots as well. According to a 2016 interview with GQ magazine, Melania revealed that Barron “speaks Slovenian fluently.” In fact, he speaks the language with his grandparents, who live near Trump Tower, according to the interview. Melania also once bragged to People in 2009 that at just three-years-old, Barron was also speaking French in addition to Slovenian and English. But two years later, during an appearance on The Joy Behar Show, Melania said, “Barron speaks two languages completely perfect. He goes from one thing to another, Slovenian/English.” What happened to French? Was he just not fluent enough to mention it yet? Does Barron Trump own a beret? These are questions of national importance that need an answer.